Discussion in 'Other Disney Collectibles' started by chubs191, Apr 13, 2019. 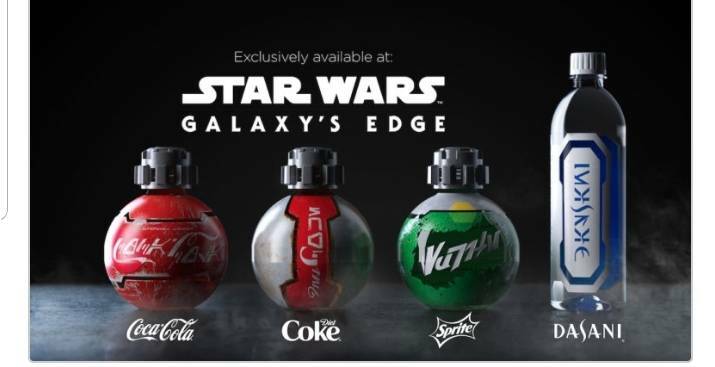 Let's discuss the merch of Galaxy's Edge! Check out this video of the Porg puppet! @timeerkat, check out the background for something you'll be interested in! Meritre and CCofRR13 like this. Meritre, CCofRR13, akarih and 1 other person like this. Ajk and CCofRR13 like this. I love that Coke is re-using that awesome Christmas ornament bottle shape they had a few years ago. XD It's perfect for this! The bottles look cool but the little knobbles on the cap look like it would be hard to get a good grip to open/close. I completely agree. They may look very space like (or what ever they were actually going for), but I can only see how they would dig in to my hand and be very uncomfortable. This would be something I hand off to someone else to try and get open for me. They will sell $5 soda grippers with them! CCofRR13, timeerkat and Meritre like this. CCofRR13, starry_solo and Meritre like this. Now watch them actually do that. MischiefMade, CCofRR13 and timeerkat like this. Though, as far as I'm concerned, as long as the Kowakian monkey-lizards don't also come with knobbles, I'm good. I'm also expecting those to be at least as expensive as the baby banshees from Pandora, though, especially if there is also a special stand for them like the log the banshees have.